Great question, considering that American consumers eat more chicken than any other meat, according to the U.S. Department of Health and Human Services. However, unlike steak, all chicken dishes should be cooked to an internal temperature of 165 degrees F to ensure that they are cooked thoroughly enough to kill any pathogens that could cause a foodborne illness, according to the Centers for Disease Control and Prevention. It’s best to use a food thermometer placed in the thickest part of the chicken to make sure it is cooked to a safe internal temperature of 165 degrees F.
Raw chicken can be contaminated with the bacterial pathogens Campylobacter, Salmonella and Clostridium perfringens, the CDC says. So if you eat undercooked chicken or other foods or beverages contaminated by raw chicken or its juices, you could get a foodborne illness. In fact, about 1 million people get sick from eating poultry that’s contaminated with harmful pathogens every year, according to CDC estimates. When shopping, place any packages of raw chicken into a disposable bag before putting it in your shopping cart or refrigerator to prevent raw juices from getting onto other foods. Wash your hands with warm soapy water for 20 seconds before and after handling raw chicken. Use a separate cutting board for raw chicken. Never place cooked food or fresh produce on a plate, cutting board or other surface that held raw chicken. Wash cutting boards, utensils, dishes and countertops with hot soapy water after preparing chicken and before you prepare the next item. If you think the chicken you are served at a restaurant or anywhere else is not fully cooked, send it back for more cooking. 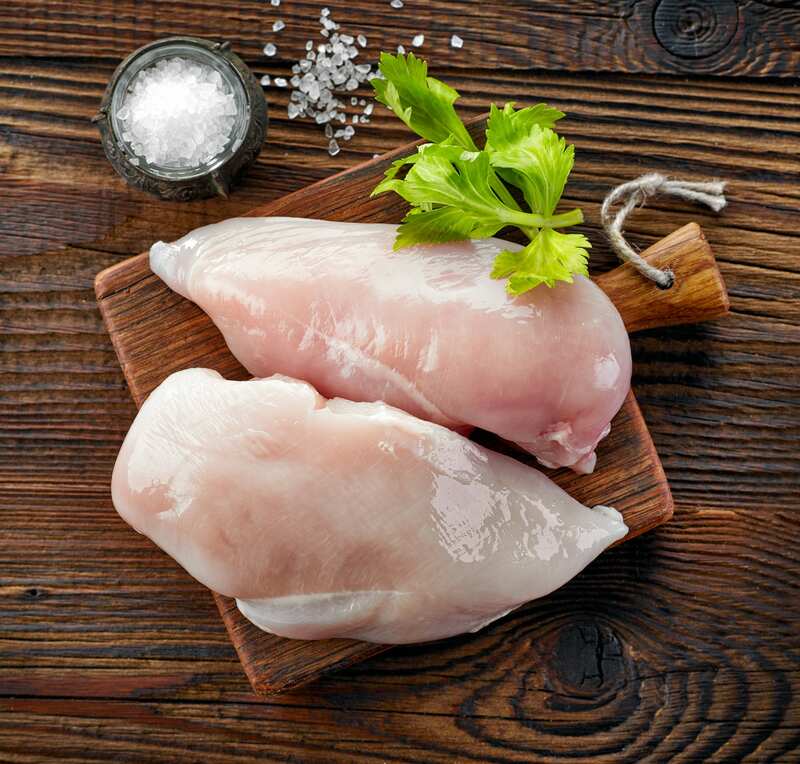 Refrigerate or freeze leftover chicken within 2 hours or within 1 hour if the temperature outside is higher than 90 degrees F.
It’s also important to remember that you shouldn’t wash raw chicken before cooking it. Rinsing or washing chicken doesn’t kill any pathogens that may be on the chicken. But when you wash or rinse raw chicken, you are likely splashing chicken juices that can spread pathogens in the kitchen and contaminate other foods, utensils and countertops, the CDC says. This is a problem because pathogens such as Campylobacter and Salmonella can survive on surfaces like countertops for up to 32 hours, according to the U.S. Department of Agriculture’s Food Safety and Inspection Service. In this case, your hubby wins the point. Because eggs are a perishable food, they should be stored in the main compartment of the fridge because the temperature is more stable there, according to the U.S. Department of Agriculture. 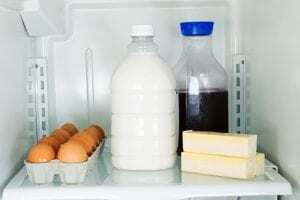 In fact, other perishable items such as raw meat and other dairy products should be stored in the main part of the fridge as well, USDA says. That’s because when a refrigerator is opened, food stored on the inside of the door is most exposed to the warmer temperatures in the kitchen. Keeping a clean and organized fridge is key to ensuring that the foods you’ve spent all that money on don’t spoil prematurely. Also, proper food placement can help reduce the risk of foodborne illnesses by guaranteeing that the right foods are in the right places and are kept at the right temperatures to ensure freshness and safety. With that in mind, when organizing your fridge, it’s important to make sure it’s set to the proper temperature to make sure your food is being preserved correctly. Proper refrigeration slows bacterial growth on food, so it’s important to keep your fridge and freezer at a temperature that will keep your food safe and help it to stay fresher longer. Refrigerators should be set to maintain a temperature between 34 and 40 degrees Fahrenheit to safely preserve your food, USDA advises. Setting the temperature too low will cause your refrigerator to work overtime and could also freeze some of your foods. Your freezer should be set to 0 degrees Fahrenheit or below. Avoid storing perishable foods in the doors of the fridge as the temperature fluctuates in this location each time the door is opened and closed. Instead, store water, juice and or condiments there. Fruits and vegetables can be stored in the sealed crisper drawers in the fridge. If your fridge allows you to customize each drawer’s humidity levels, you should set the vegetable drawer to a higher humidity, while setting the fruit drawer to a lower humidity. Raw meat, poultry and seafood should always be stored on the lowest shelf of the main compartment of the refrigerator. These items should also be well wrapped or in a sealed container to prevent juices from leaking onto other foods. When storing cooked leftovers, place them on the top shelves in the main compartment of the fridge, above uncooked foods. Refrigerated leftovers are safe to eat up for up to four days. To help keep your fridge clean smelling and to absorb odors of other foods, you can place an open box of baking soda on a shelf in the main compartment. Lastly, you should try to clean spills in the fridge immediately with hot, soapy water. You can also sanitize your fridge with a diluted bleach solution of 1 tablespoon unscented liquid chlorine bleach to 1gallon of water. You may be referring to a Sept. 5 tweet by the U.S. Consumer Product Safety Commission that reported on the number of trips to hospital emergency rooms that consumers across the country have said were associated with … pizza. Yep, I said “pizza” and “emergency rooms” in the same sentence. How is that possible? And, according to the tweet, at least one person fell out of bed while reaching for a pizza. D’oh! 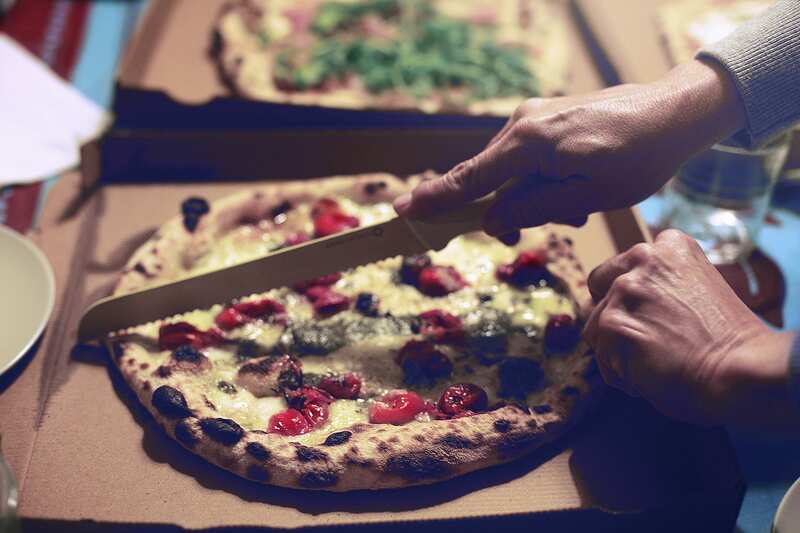 The data for the pizza injuries report was generated by the CPSC’s National Electronic Injury Surveillance System, which collects data on consumer product-related injuries that occur nationwide. 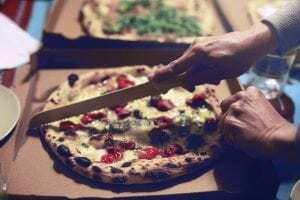 Injuries aside, pizza remains one of the nation’s most popular foods, with about 1 in 8 Americans reporting that they consume pizza on any given day, according to a report from the U.S. Department of Agriculture. Most adults, 59 percent, eat pizza for dinner, while 28 percent of adults eat it for lunch. Some 11 percent of adults eat it for a snack, while 2 percent of folks even eat pizza for breakfast. USDA data also shows that on a day that a typical adult eats pizza, the pie accounts for approximately 27 percent of that person’s daily calorie intake, 39 percent of that person’s daily saturated fat intake, 38 percent of that person’s daily sodium intake and 35 percent of that person’s daily protein intake. The pizza also serves as a source of important vitamins and minerals: On a typical day, the dish provides 37 percent of the person’s calcium intake and 58 percent of the person’s lycopene intake. So the next time you indulge in pizza, enjoy, but take it safe and easy. Editor: This column was reviewed by Jenny Lobb, Family and Consumer Sciences educator for Ohio State University Extension. Last week, lawmakers in Missouri became the first nationwide to create new provisions in their state’s Meat Advertising Law that require that any food or meat product that is called “meat” must be derived from livestock or poultry flesh. 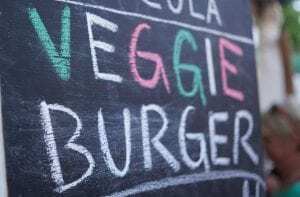 The new provisions, which will begin to be enforced Jan. 1, 2019, say that meat products that aren’t derived from animal flesh must include a statement on the product packaging that says if the product is “plant-based,” “veggie,” “lab-grown” or “lab-created,” or if it is “made from plants” or created “in a lab,” according to a statement from the Missouri Department of Agriculture. Plant-based meat is made from plant-based proteins including soy and peas. Clean meat, which has also been called “cultured meat” or “lab-grown meat,” is made of cultured animal tissue cells, according to the Food and Drug Administration. There is nothing new about plant-based “meat-like” products, but under meat inspection, names of meat products must meet the standard of identity that has been established by the U.S. Department of Agriculture’s Food Safety Inspection Service, said Lynn Knipe, an associate professor of food and animal sciences in the College of Food, Agricultural, and Environmental Sciences at The Ohio State University. Currently, these products could not be labeled as meat and would have to be labeled with a name such as “imitation meat,” which would not be attractive to most consumers, he said. But the use of the word “clean” is very misleading, he said. The issue of meat and meat product labeling is significant, considering that U.S. consumption of beef, pork, chicken and turkey has increased to a projected 214.8 pounds per person compared with 210.8 pounds per person in 2014, according to USDA. Meanwhile, the meat-substitute industry generated some $4.2 billion last year, according to Allied Market Research. The United States Cattlemen’s Association filed a petition with USDA requesting that the agency establish a food labeling requirement that the word “beef” only be used to refer to products that come from cattle that were born, raised and harvested in the traditional manner. And at least four organizations, including the plant-based meat company Tofurky, the Good Food Institute, the American Civil Liberties Union of Missouri and the Animal Legal Defense Fund, have filed a federal lawsuit against Missouri’s new law provisions. 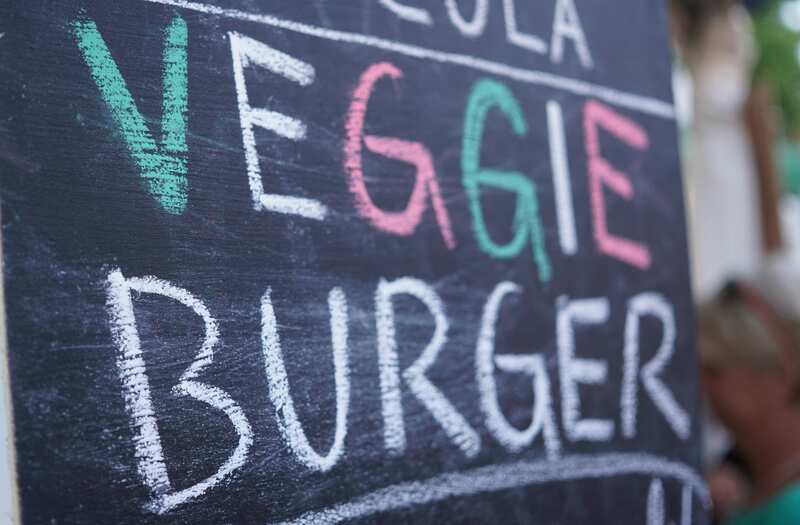 Editor: This column was reviewed by Lynn Knipe, an associate professor of food science and technology in the College of Food, Agricultural, and Environmental Sciences at The Ohio State University.